Disclaimer: Twitter is currently overhauling it’s verification process, suspending new applications indefinitely. We’ll be the first to let you know when it’s back! In the meantime, see our original article below. The goal for Twitter, when it introduced verified accounts, was to help more people find great, high-quality accounts to follow. And, for creators and influencers to easily connect with a broader audience. From anywhere in the world. But now… it’s something different. First, Twitter verified users have access to a few more tools. Second, you can filter your notifications stream. By including only replies, likes, and retweets from other verified users. Same for messages. This is especially useful for those with a large following. You can also opt out of group, direct messages. But the real reason verification matters? To help us all be less bothered with abuse. We’ve all seen, read, or heard about poor behavior on our social platforms. Like this. Ugh. With more verified Twitterers, see only the nice messages. With this base growing, you want to make sure your messages get to your intended recipients. So that others won’t filter you out. What started out as something elite has become middle-class. Verification will help us behave better, be seen more, and have great conversations with others. Go get that blue checkmark next to your account name. 85 percent of consumers buy products or services from brands they trust. 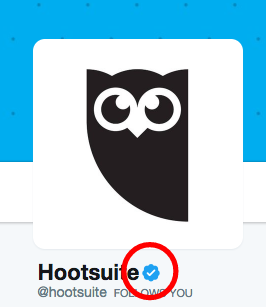 This verified checkmark will help others trust your brand, too. What types of accounts does Twitter verify? Well… I’ll just say it like Twitter does. The biggest factor for Twitter verification is that your profile is of public interest. Here’s some tips to help you get ready—before completing the verification process. Not an exact science, but these can only help. And will. Tweet often—twice per day, at least. You can do that, right? Be seen as active and involved with your audience. Make Twitter take notice that your audience cares about your public impact. Twitter wants to protect the quality of their community. Help Twitter help you by creating and sharing valuable content with your followers. Frequently. Consistently. 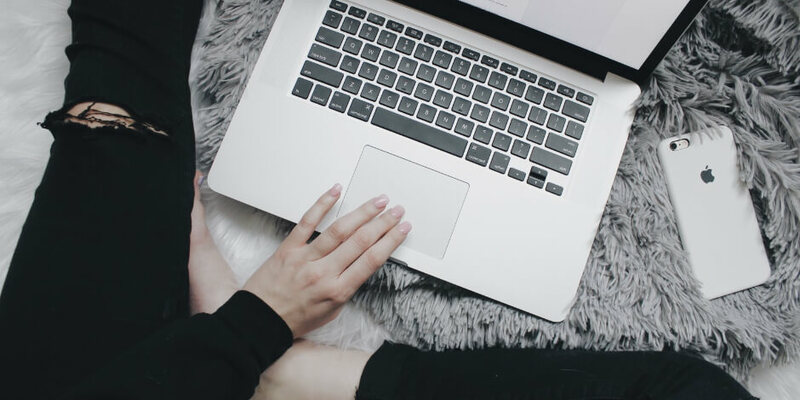 Bonus: Hop onto Hootsuite and fill up your queue with tweets for the next 30 days. I’m just sayin’. Another opportunity to enhance your brand—with a strong and clear Twitter bio. For your individual account, list your job title, or maybe even a benefit you offer. And include links to other verified accounts (more on this in tip number four). Got a website? Of course, you do. Include it. This will help Twitter cross-check your identity. Plus, you want people to check you out. Here’s a few more tips for writing a great bio to increase your odds of getting verified. State a strong call-to-action. Duh. …by creating and uploading an image to your Twitter profile—be it a logo, illustration, or photo. And for the header, how about a picture of you doing something important, like speaking on stage? So others will recognize you. Immediately. Surely, your followers will not take you seriously if you don’t. And neither will Twitter. Twitter recommends a profile image size of 400 x 400 pixels, and a header image dimension of 1500 x 1500 pixels. Do as they suggest to boost your chances of getting verified. Show who you roll with. We’ve all heard that the people we hang with says something about us. Show some social proof with your positive connections to other verified accounts. For example, include something like “Writer at @Hootsuite” in your bio. This will boost your credibility. Following verified accounts shows that you’re serious about engaging in a worthwhile community. Too, tag these verified accounts in your content when appropriate. Yup, the same applies to writing a paragraph, for why you deserve to be verified (which they ask during the request process). Twitter wants to understand your impact on the world. How will you or your company provide great, fast, trusted support to the audience? How will people do and be better knowing what you know? How are you helping the world at large? Share the ways your brand adds value to the Twitter community. Better to give than get. Though do this right, and you’ll achieve both. Having a precise location can only help Twitter verify your business. And, to understand your activity in the offline community. Plus, this can help you establish more real-life relationships with other Twitter users. By relating to where you live, work, and play. We said six ways, but then again, math ain’t my strong suit. A few more tidbits for getting Twitter to say ‘yes’ to your request. Max out: Twitter will ask for two links, minimum. Submit five, say with links to: bylines, press releases, awards, and more. Show off your fabulous work and mentions. We’ve covered quite a bit. Like… why get verified, types of accounts that get verified, and tips for increasing your odds. You ready to get that blue checkmark next to your account name? Best to get organized and ready before submitting your request. Do these so Twitter won’t ask you to resubmit the form. Just like we talked about. Help Twitter see how awesome you (or your company) are by sharing your impact on the world wide web. You want Twitter to give you some love, right? Okay, don’t have five links? Fine, add what you can. Do your best. Now you’re ready to share (ah, how nice). Another way to make nice with Twitter. Before you write a word, know this: People don’t care about what you do. They do care about what they can get from what you do. So then… write from the reader’s perspective. Explain why the Twitter-verse will benefit from what you do. You’ve put a lot of work into this. Finish strong by reviewing what you did, what you wrote. Including the items below. Let it go. It’s up to Twitter now. They have millions of accounts to review. So hang in there and keep maintaining your account for when Twitter gets to your request. If they approve it, you’ll receive a Direct Message in your Twitter account. As you can see, it’s not a 10-minute-thing to request account verification. At least not if you actually want to become verified. Apply yourself as we discussed, you’ll increase your chances for Twitter to see and believe in you. We certainly do! Use Hootsuite to manage your Twitter presence alongside all your other social media channels. From a single dashboard you can monitor conversations and lists, grow your audience, schedule tweets, and much more. Try it free today.